Each spring, for the past 24 years, we've raised turkey; Royal Palm, Narragansett, Bronze, Bourbon Red, and several others, primarily heritage breeds, though. Occasionally we would find a 2 – 3 day old turkey poult, that appeared perfectly healthy earlier, dead on its back. Researchers believe this is a neurological disorder with a genetic component called Early Poult Flip-overs (EPF). Not one to argue with research, however through observation this issue seems more of a developmental problem. Our solution is simple, successful, and has eliminated the problem. 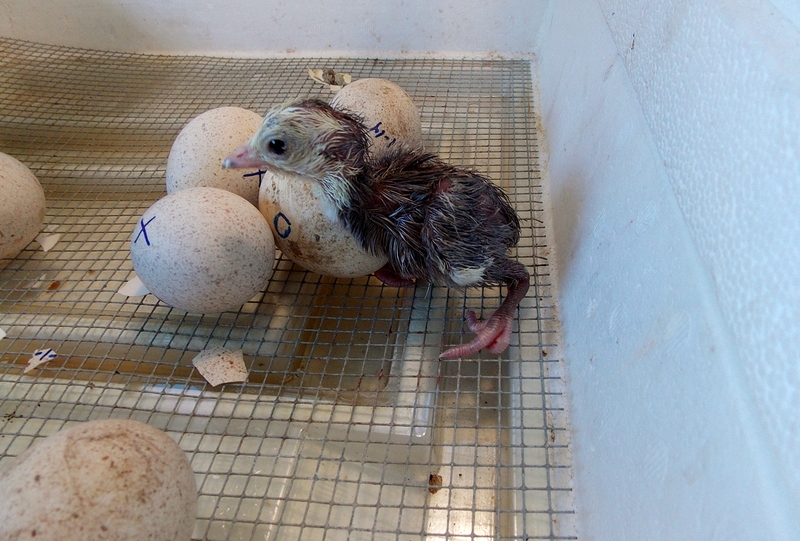 Newly hatched turkey's legs are weak, and their bellies big, it's difficult for them to to right themselves. They get stuck on their back, legs paddling, and chirp in distress. If you aren't there to help them they'll die. 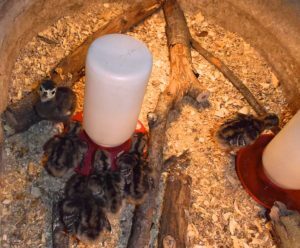 If you are going to place newly hatched turkeys in to protein tub brooders wait for one week to ten days and follow this plan instead: Place newly hatched turkeys into a brooder with varying sizes of sticks or small tree branches. If the poults get cast they can right themselves by pushing against the branches. The hatchlings easily navigate through the branches to access feed and water. After a week or so their legs are stronger, they're out of danger from EPF, and they're ready for the protein tub brooders. Turkeys are easy to raise once you get them past the first few weeks which is a fragile stage for poults.